Appalachian State grad. Boyishly handsome. Loves the NFL draft. Am I talking about me or Daniel Jeremiah, the NFL Network’s draft guru now that Mike Mayock is running the Raiders personnel department. In this case, I’m talking about DJ. He just put out a new mock draft and had an interesting choice for the Eagles. DJ had the Eagles picking Marquise “Hollywood” Brown, the explosive WR from Oklahoma. Would the Eagles really take a WR in the first round? Sure. 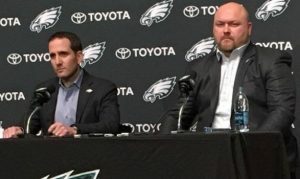 Howie Roseman is on record as saying that is a position where you draft more for the future than for immediate impact. Receivers can struggle as they adjust to life in the NFL. The more time you give them, the better off they’ll be. While Brown could offer help in 2019, you draft him with the expectation that he’ll primarily be a role player as a rookie and will offer more impact in 2020. And Brown could be an impact player. With his speed, defenses must pay attention to him at all times. When the ball is in his hands, Brown is a threat to deliver a big play. The question I have is whether he will be on the board at 25. While certainly possible, it is far from a lock. He is small and coming off an injury. After the struggles of John Ross, that might make some teams nervous. But that speed is legit. And speed is good. Nelson Agholor is in the final year of his contract so the Eagles might need WR help in 2020. Taking a receiver early, even in the first round, would definitely make sense. We’ll find out a week from now. Seems like more and more people want the Eagles to trade back. I certainly get that. It would be great to add a third round pick. At the same time, the real key here is adding talent. If the right guy is there, take him. Forget about adding extra picks. There was some talk recently about Corey Clement having a torn ACL. Luckily, that’s not the case. Clement has his limitations, but he could be an important role player this season. With him and Jordan Howard, you have the foundation of a solid backfield. Clearly the Eagles need to keep adding talent, but it helps when you have something to build on. There was talk last spring about Clement possibly being a starter. I’ve never seen that out of him. Clement can catch the ball. He’s a good change-of-pace runner. He’s tough, smart and reliable. The coaches trust him. But at the end of the day, I still see him as a role player. The Giants don’t want to admit they should be rebuilding. That’s bad for them…and good for us. Dave Gettleman is the gift that keeps on giving. The NFL schedule is out. Good news. The Eagles open with the Skins. Every time the Eagles have won the Super Bowl, they played the Skins in the season opener. Bad news. The Eagles have never won the Super Bowl when the season opener was a home game. Sadly, that’s about as good as schedule analysis can get in April. You don’t know a team will be healthy or hot when you play them. Who would have expected to lose to the Bucs, Titans and Panthers last year? Who thought the Jaguars would be one of the worst teams in the league? Three straight road games. The Eagles go to MIN, DAL and BUF in the middle of the season. Those can be tough places to play. Sometimes a series of games like that can bring out the best in a team. The flip side. Week 9- Week 12 will be three straight home games and the bye. This is a stretch where the Eagles need to play well. When you have a favorable situation, you must take advantage of it. Good bye. The bye week is Nov 10th. That’s about ideal. Players have gone through more than half of the season and are ready for the break. All of this is in theory, of course. If the Eagles are really banged up, they might wish the bye came earlier. But going off a generic calendar, early November is when you want your bye. No 12th Man. Seattle comes to Philly. It feels like the Eagles have played at Seattle 37 times in the last decade. Reality won’t back that up, but might delusional mind rarely trusts reality. I am desperate for the Eagles to beat Russell Wilson and Seattle. Please make this happen. Losing to them drives me nuts. Kill the Goat? It is fun to talk trash about Bill Belichick, Tom Brady and the Patriots, but regardless of how you feel, this is a special group. And this could be the last time the Eagles face the Big Bad Patriots. Tom Brady has never lost a regular season game in Philly. It would be great to change that. Who’s your Daddy? No Rams in the regular season. I guess Doug Pederson will have to wait until the playoffs to once again prove that he owns Sean McVay. Closing close. The Eagles won’t have to do much traveling in December. They open with a game in Miami. I’m sure Eagles fans are happy with a quick December trip the the land of sunshine. After that, there are two homes games and trips to NYC and D.C. That’s the way you want to close out a season. Prediction…12-4. I spent almost one minute coming up with that so please make sure to treat it with the appropriate reverence. The Eagles have to face 3 teams (the Jets, Patriots, and Seahawks) coming off their bye week, they have a Thursday road game for the 5th time in the last 6 years, and they have three consecutive weeks in which they have to play on the road. The trifecta of bad scheduling. The #Eagles play in Buffalo, Green Bay and Minnesota all before November. And they play Miami in December. I'd like to personally extend a big thank you to the NFL schedule-makers. About a month ago, there were some issues with malware. They only affected some people. I was able to access the site through 5 different computers and my phone and never had a problem. Others got some bogus pharmaceutical nonsense. Cleaning that up led to the site going down for a day. I think we’re all good now. Please let me know if you do have any problems. The Eagles offseason began on Monday. That gave the media a chance to meet with some players. Here is the video if you want to watch. If you don’t want to watch, turn to Sheil Kapadia for his takeaways. One of the things that stood out to me is the way all three talked about 2018. That was a frustrating and disappointing season. The Eagles went 9-7, won a playoff game and almost made it back to the NFC championship. I can see plenty of teams being pretty happy with that. To the Eagles, that wasn’t good enough. They wanted more. I think that is a great sign for 2019 and beyond. Some teams get a taste of success and it changes them. They lose focus. They lose the hunger that drove them to win. They can start to be more individualistic. Winning games hasn’t sated the Eagles. They sound as hungry as ever. One of Doug Pederson’s messages to his players is that the season starts now. Some teams get amped for Training Camp. That’s real football, with hitting and tackling. Others think of the preseason, when you actually face other teams. Some wait for September and the regular season, when games actually count. Pederson wants his players to know that winning starts now. What you do in April makes a difference. This gets you ready for September. Don’t blame the medical staff for this one. Adams got hurt and had surgery when the season was over. He is expected to be ready for Training Camp. Adams isn’t as important with the addition of Jordan Howard, but I was hoping he would get a full offseason to develop. Adams showed good potential last year. He isn’t a guy you want leading your team in rushing, but he’s got NFL ability. Kelce also had good things to say about Matt Pryor, who would be the backup RG as of now. Does this mean anything? Not really. While Kelce’s comments don’t mean all that much, it is better than the option. He could avoid talking about them or say something negative. Kelce took the time to share his thoughts on the young guys and OL coach Jeff Stoutland’s ability to develop young players. I really can’t wait to see Mailata play. I’m curious to see just what he can do this year. The Eagles should trade up to get Ed Oliver. No, the Eagles should move back and take the best DT left. They could use another mid-round pick. The Eagles should just stay put. There will be good value at 25. Those are the three options facing Howie Roseman and the Eagles front office. What will they do? What should they do? Obviously it is difficult to come up with a definitive strategy right now. You can have a pre-draft plan, but you don’t know how things will unfold until the picks start coming off the board. If the right player falls down to a reasonable range, moving up suddenly starts to look a lot better. If several players you like are headed your way, just stay put. You’ll get one of your targets. Trading back is the most complicated option. You are moving back to an area and projecting that a player you like will be available. You do add resources for later in the draft or in the future and that certainly has value. Mike Kaye wrote a good piece on some draft options, going up and moving back. Jeffrey Lurie talked at the owners meetings about the Eagles need for having a good amount of picks for this year and next year. The Eagles are going to need cheap talent when they hand Carson Wentz the big bucks. The team also needs younger replacements for the older guys on the roster. With that in mind, is trading up even an option? I still think it is. Teams are built on foundational players. You can find those guys anywhere in the draft. Neither Tom Brady nor Rob Gronkowski was a first round pick. Still, the bulk of your elite talent does come early in the draft. Aaron Donald, Jared Goff and Todd Gurley were all first round picks. Fletcher Cox, Carson Wentz and Brandon Graham…all first round picks. I used Ed Oliver as an example earlier because he’s talked about a lot. The Eagles could have several guys they covet. They know they can’t move up inside the Top 10, but the Eagles do have enough ammo to make a bold move if they want to. I would hate to see the picks go, but if Howie & Co. feel that strongly about someone, I would get where they are coming from. Let’s say they see DT Christian Wilkins from Clemson as another Fletcher Cox type of talent. Wouldn’t you want them to aggressively go get that guy? What if they project DE Montez Sweat to be another Ryan Kerrigan? What if they see OL Jonah Williams as a Zach Martin level of blocker? Sometimes you look at the draft and you want volume. Rebuilding teams need bodies more than impact players. Sometimes you have a stable roster and you focus more on talent. The Eagles can go in either direction. The roster is good right now. That gives Roseman the freedom to react to what happens on draft night in different ways. It will be very interesting to see what they do. Speaking of Montez Sweat…let’s see what Franimal says.